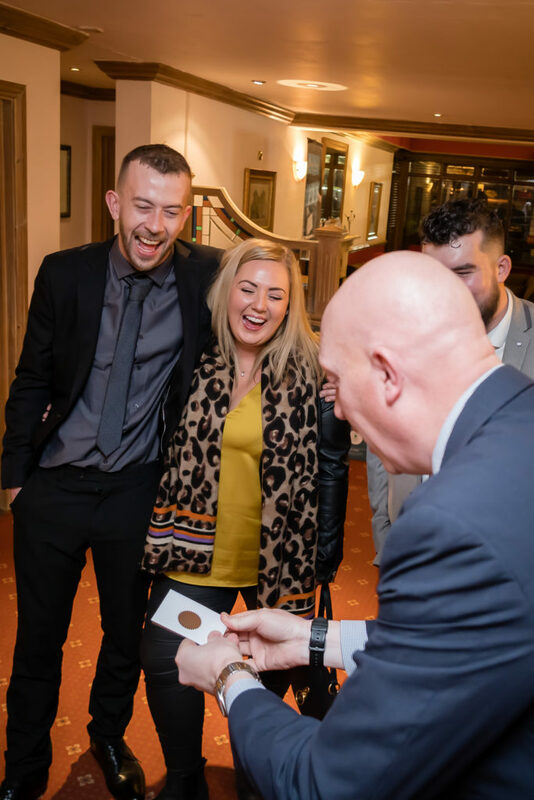 Although I travel the length and breadth of the UK to perform magic at weddings and events, it’s always nice when one is local. On Saturday I entertained at Sam and Chris’s wedding at the Holiday Inn Padworth in Berkshire, which is on the outskirts of Reading and about three miles from my house. I must admit that I naturally do try to keep my marketing and promotion limited to the Home Counties, but as most of the people who book me nowadays have seen me at another events my geographic spread is widening. Anyway, I digress. What I was really meaning to say was that though I people spread the word about me; sometimes that word comes closer to home, not further. So, it was nice to keep Sam and Chris’s guests entertained whilst they were away doing their photographs. One of the issues with a wedding in the winter months is the weather, which when compounded with the light fading in afternoon, means that guests are restricted to waiting inside. However, from my point of view this is great because it means I have a captive audience for a couple of hours, and can easily mingle between groups to ensure no one misses out on the entertainment. 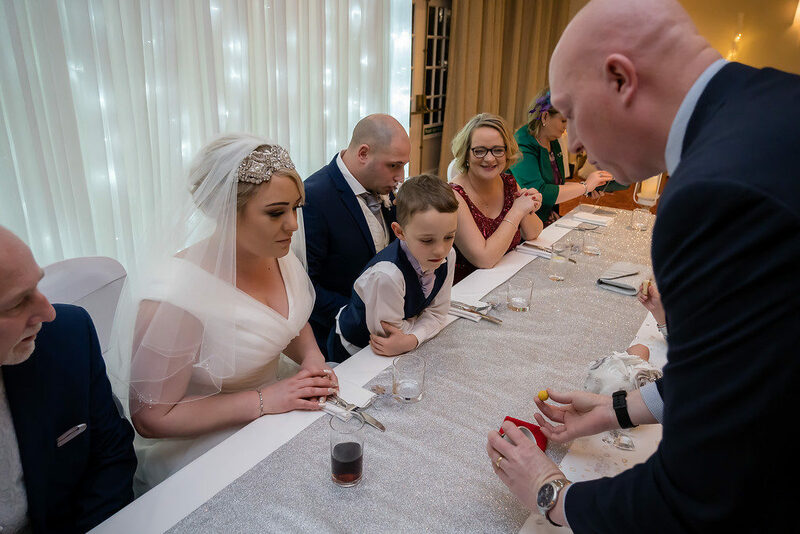 Once the photographs had been taken the guests were called through to take their seats for the wedding breakfast and the bride and groom were formally introduced. 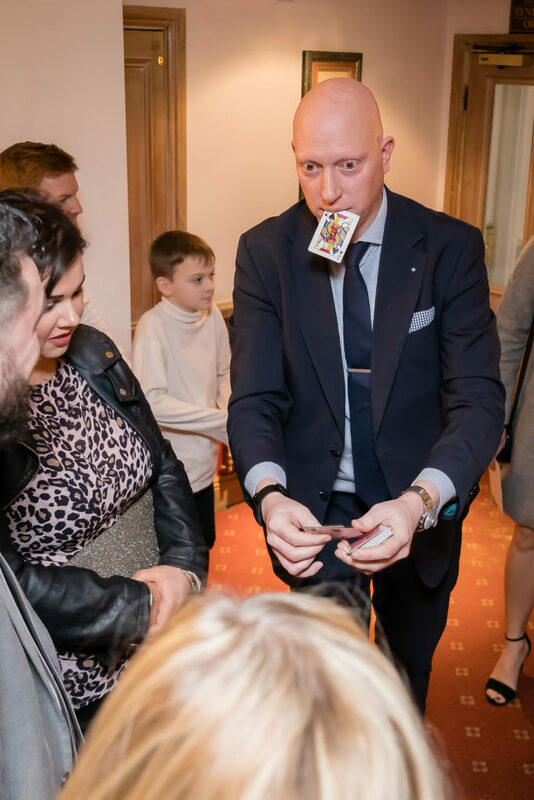 I used this opportunity to perform some tricks for the top table, as out of all those attending, they were the ones that had seen the least magic. I also went round the tables (avoiding those eating!) to show a bit more magic. Hi Robert , me and Chris would like to just say a massive thank you for yesterday! You were absolutely amazing , what you do is so so clever and everyone thoroughly enjoyed it and you were the talk of the evening ! !